Following up on this week’s A Blog of Games entry, we’ve got Woodland Creatures, a bestiary for the Chronicle System, the rules that power A Song of Ice and Fire Roleplaying. 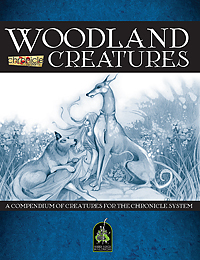 This 33-page PDF features animals, beasts, horrors, and legends your characters can encounter in wilderness areas in a homegrown setting utilizing the Chronicle System, or in a Westeros that diverges from the accepted canon. Please keep an eye out for new Chronicle System products!